May 28 in 1987 was declared the International Day for Women’s Health, a special day on which women’s health takes center stage. Since then, May 28 has been internationally renowned and women’s health groups hold activities worldwide. In 1999, it was officially recognised by the government of South Africa. It is therefore an occasion to celebrate the gains for women’s health as well as a reminder to keep our commitment to women’s health and rights. The health of women and girls is of particular concern because, in many societies, they are disadvantaged by discrimination rooted in sociocultural factors. According to the World Health Organization (WHO), some of the sociocultural factors that prevent women and girls from benefiting from quality health services and attaining the best possible level of health, include unequal power relationships between men and women, social norms that decrease education and paid employment opportunities, an exclusive focus on women’s reproductive roles, and potential or actual experience of physical, sexual and emotional violence. While poverty is a significant barrier to positive health outcomes for both men and women, poverty also tends to yield a higher burden on women and girls’ health. At the same time that policies and programmes may have contributed to enable women to lead healthier lives, significant gender-based health disparities remain in many countries like South Africa. With limited access to education or employment, high illiteracy rates and increasing poverty levels are making health improvements for women exceeding difficult. Gender-equitable approaches to health are needed to enable women’s full participation in the planning and delivery of health services. Noncommunicable diseases (NCDs), also known as chronic diseases, tend to be of long duration and are the result of a combination of genetic, physiological, environmental and behaviours factors. The main types of NCDs are cardiovascular diseases (like heart attacks and stroke), cancers, chronic respiratory diseases (such as chronic obstructive pulmonary disease and asthma) and diabetes. NCDs disproportionately affect people in low- and middle-income countries where more than three quarters of global NCD deaths (31 million) occur. People of all age groups, regions and countries are affected by NCDs. These conditions are often associated with older age groups, but evidence shows that 17 million of all deaths attributed to NCDs occur before the age of 70. Of these premature deaths, 87% are estimated to occur in low- and middle-income countries. Children, adults and the elderly are all vulnerable to the risk factors contributing to NCDs, whether from unhealthy diets, physical inactivity, exposure to tobacco smoke or the harmful use of alcohol. Unhealthy diets and a lack of physical activity may express itself as raised blood pressure, increased blood glucose, elevated blood lipids and obesity. These are called metabolic risk factors that can lead to cardiovascular disease, the leading NCD in terms of premature deaths. In terms of attributable deaths, the leading metabolic risk factor globally is elevated blood pressure (to which 19% of global deaths are attributed). In the list of the main risks factors there are the modifiable behavioural ones such as physical inactivity, unhealthy diet and the harmful use of alcohol. The other risk factor is the metabolic risk, that contributes to four key metabolic changes that increase the risk of NCDs: raised blood pressure, overweight/obesity, hyperglycemia (high blood glucose levels) and hyperlipidemia (high levels of fat in the blood). 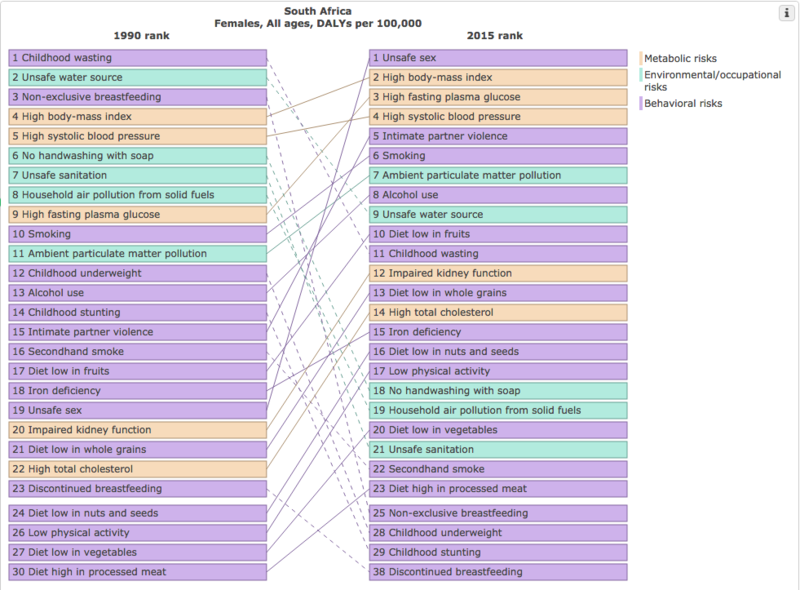 To make it clearer, we can have a look at some statistics related to health in South Africa. In 2012 for both men and women, the probability of dying between ages 30 to 70 years from the main four NCDs, which are Cancer, Diabetes, Cardiovascular diseases and Chronic Respiratory diseases, is around 27%. 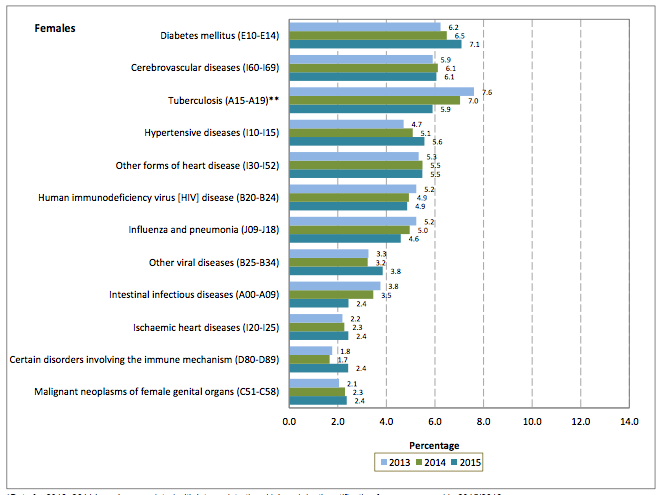 NCDs are estimated to account for 43% of total deaths of the total deaths for all ages and both sexes. Moreover, regarding the Statistics (Stats SA), Diabetes has been steadily increasing over the years for females, from 6,2% in 2013 to 7,1% in 2015, which moved to leading underlying causes of death in 2015. If we focus on the risk factors in females, the data gets more alarming due to raised blood pressure in women of more than 25 years was accounting in 2008 with around 35%, raised blood glucose was around 12% and around 43% for obesity in women of more than 20 years. To get a more accurate conclusion, we can have a look at the DALYs, the disability-adjusted life year, which is a measure of overall disease burden, expressed as the number of years lost due to ill-health, disability or early death. As we can see in the graphic, the increase of the percentage between 1990 and 2015 in high body-mass index (27.19%) and high fasting plasma glucose (37.6%) is shocking and has put these risk factors to the top rank of DALYs. The Noakes Foundation promotes global health and puts emphasis on women’s health, specifically through health and nutritional education. A women’s health is her total well-being, not determined solely by biological factors and reproduction, but also by effects of workload, nutrition, stress, war and migration, among others. The health of families and communities are tied to the health of women. The illness or death of a woman has serious and far-reaching consequences for the health of her children, family, and community. Women who are given the responsibility of looking after families also need their own space and time. This means that they rarely have time to relax and evaluate their lives. Emotional well-being is connected to the physical well-being of women. At the same time, women do not need to be patronized about their health, they can understand the issues and take the appropriate steps to ensure that they are in control of their health status. Through this statement, community interventions like Eat Better South Africa invest in women’s knowledge in the field of health and nutrition. In order for communities to benefit from the knowledge, which women possess, a renewed self-confidence of women has to be encouraged. Investing resources in primary health care programmes which includes health education and the application of health promoting activities based on simple but scientifically sound measures in which women can participate at local level, is likely to provide more benefits than traditional efforts dedicated to the formation of highly skilled professionals who practice medicine or nutrition in clinics and hospitals. Let’s take this special day to continue promoting Women’s Health and help empower women around us to become the best version of themselves! Georgina Pujol-Busquets Guillén is from Barcelona and is currently interning at The Noakes Foundation – she is an instrumental member of the team working on the upcoming Eat Better South Africa! community intervention program.